In a 5-4 ruling, the Supreme Court of Canada on Friday gave a green signal for assisted suicide to begin now under certain circumstances, while providing the new Liberal Government four months time to pass a law regulating such practice. The Court ruled that doctors in Quebec would be allowed to facilitate the procedure, as the Province of Quebec had already put the law into effect in December. People anywhere else in the country can apply to their Provincial Superior Court for judicial authorization “to those who wish to exercise their rights” to doctor-assisted death, in accordance with the criteria set out in the 2015 ruling. The court observed that granting the further extension is an “extraordinary step,” “since its effect is to maintain an unconstitutional law.” Chief Justice Beverley McLachlin and three others disagreed with giving an exemption to Quebec and to other individuals. It was noted by the Court that this was the first time that it had been asked to consider whether to grant individual exemptions during an extension of a suspension of declaration of invalidity. “Parliament was given one year to determine what, if any, legislative response was appropriate. In agreeing that more time is needed, we do not at the same time see any need to unfairly prolong the suffering of those who meet the clear criteria we set out in Carter. An exemption can mitigate the severe harm that may be occasioned to those adults who have a grievous, intolerable and irremediable medical condition by making a remedy available now pending Parliament’s response,” it observed. In using the word “irremediable,” the court said patients were not required to undertake treatments they deemed unacceptable. You may read the judgment and LiveLaw article here. The General Elections in October and the subsequent change of Government had delayed the task of putting the legislation in place. The Justice Minister had now demanded that the decision be stayed for another six months. Meanwhile, the Nova Scotia College of Physicians and Surgeons has released a draft document to function as a guide for doctors who will be involved in physician-assisted suicide. The guidelines were formulated by a working group put together by the college, in the absence of any federal or provincial legislation. The working group included the province's Health and Wellness Department, Justice Department, Doctors Nova Scotia, the Nova Scotia Health Authority and Dalhousie University's Health Law Institute. The document has been released online, inviting comments from various stakeholders. While Canada has chosen sides in the debate, the discussion in the Indian Supreme Court is alive once again, with a five Judge Constitution Bench demanding a reply from the Centre on whether prolonging a patient's life by putting him on ventilator or life support system against his will could amount to torture of the patient and be financially draining for his family. The Bench comprised of Justice A.R. Dave, Justice Kurian Joseph, Justice A.K. Goel, Justice S.K. Singh and Justice R.F. Nariman. Additional Solicitor General P.S. Patwalia informed the Court that the Centre was analyzing Law Commission's 196th and 241st reports recommending legalization of passive euthanasia. Representing the NGO Common Cause, Advocate Prashant Bhushan put forth the concept of a ‘Living Will’, in which a person when in sound mind and good health records his wish that he should not be kept alive with the help of ventilators if doctors at any stage of his life opine that he cannot be kept alive without life support system. The issue was referred to a Constitution Bench in February, 20014, stating that while an earlier judgment of the court on voluntary passive euthanasia in Aruna Shanbaug’ Case did lay down a certain procedure, the same was not clear. Chief Justice P. Sathasivam had said that they were leaving it for the Constitution Bench to examine the whole issue exhaustively, without making any references. You may read the LiveLaw article here. 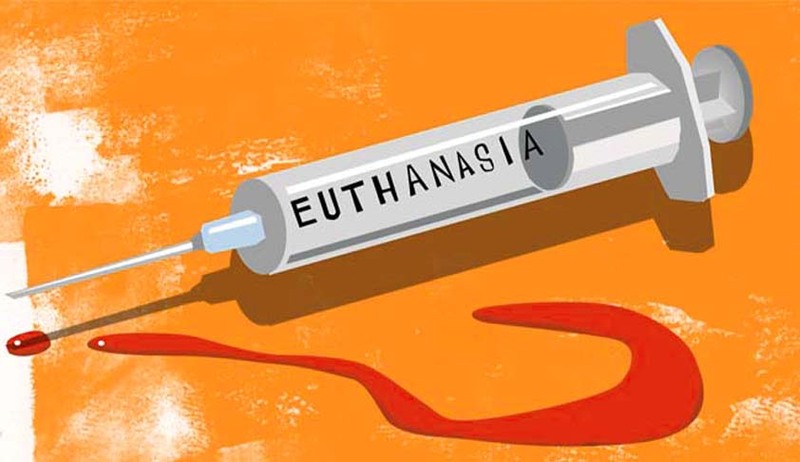 Earlier, a five Judge Bench of Supreme Court in Gian Kaur v. State of Punjab held that both euthanasia and assisted suicide are not lawful in India and overruled the two Judge Bench decision in P. Rathinam v. Union of India. The Court held that the right to life under Article 21 of the Constitution does not include the right to die. But later in Aruna Ramchandra Shanbaug v. Union of India the Supreme Court held that passive euthanasia can be allowed under exceptional circumstances under the strict monitoring of the Court.